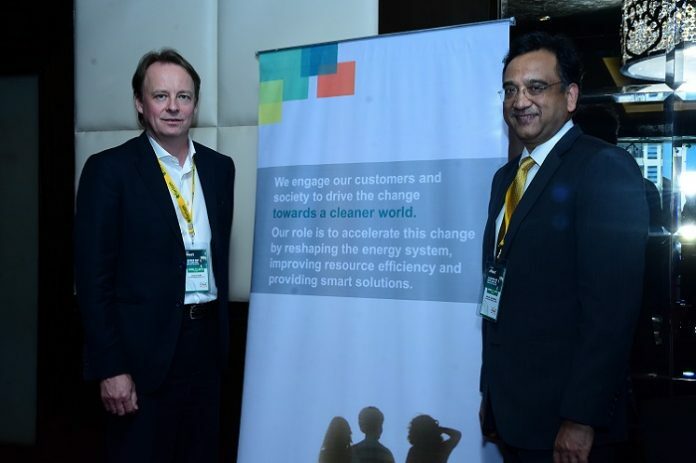 (L-R) Juha Suomi Area Director, Asia, Fortum eNext and Sanjay Aggarwal, Managing Director, Fortum India introducing NOx Reduction Technology in India. Fortum, a Finnish energy company is bringing its proven NOx (Nitrogen Oxide) reduction technology in India under the new business ‘Fortum eNext’. As part of this initiative, it organized two seminars in Delhi and Mumbai respectively. The seminar was attended by leading industry experts, regulatory and pollution authorities and power plant companies. The seminar was aimed at showcasing Fortum’s innovative global technology and its holistic solutions, with a special focus on offerings for thermal power plants in India. “Thermal is going to be a mainstay in India’s energy mix for the next 30 years. Burning fossil fuels like coal leads to acid rain and is the largest source of greenhouse gas emissions warming up the planet. Many countries already have a strict limit on the emission of nitrogen oxides; thus, NOx reduction technologies are being widely deployed. Keeping a clean energy spectrum in mind, India also recently introduced its NOx emission limits, wherein pollution control technologies will be installed on most coal-fired plants,” said Sanjay Aggarwal, Managing Director, Fortum India. In 2017 NTPC gave Fortum eNext the possibility to perform a pilot study at its Ramagundam power plant on two 200 MWe wall fired boilers, and one 500e MW tangential fired boiler. The aim of the study was to demonstrate and prove that Fortum’s long utilised NOx reduction technology is suitable also for the Indian market. During the study, Fortum carried out various field data analysis, tests with local coals in different coal mill operations and combinations, measurements of NOx emission levels at different production loads, as well as Computational Fluid Dynamic modelling combined with their burner technology. Results showed that this technology can be implemented to meet the desired NOx emission levels given by the Indian regulation at any local power plant in India.